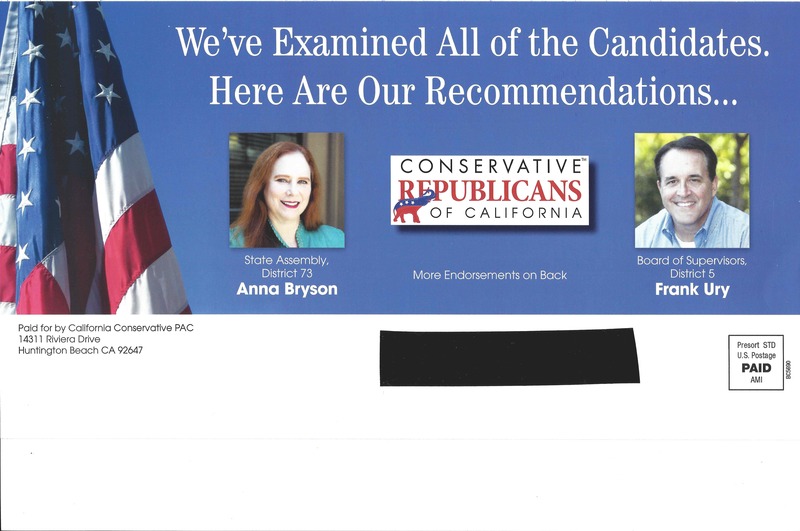 The final mailer our household received this Primary came from the California Conservative PAC. Unfortunately they duffed up the mailing list and sent us info on several candidate we can’t even vote for. Whoops! It’ll be interesting to see if anyone winds up in the mailbox tomorrow. 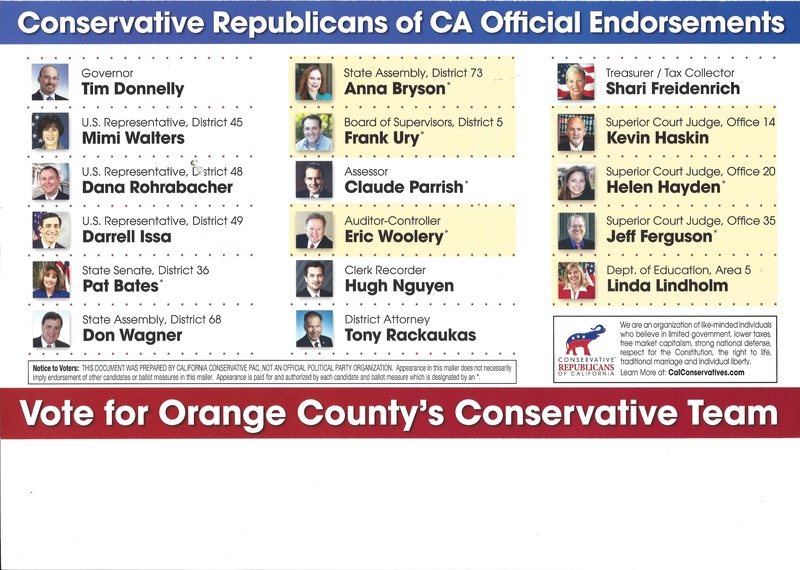 We’re live from the Republican Party of Orange County’s third and final Endorsements Committee meeting for the June 2014 Primary. The Endorsements Committee will make recommendations to the full Central Committee, who will vote on May 19 on the actual endorsements. On the docket are Fifth District Supervisor and Superior Court Judge Office Number 35. Mayor/Businesswoman Lisa Bartlett, Orange County Businessman/Councilmember Robert Ming, and Councilmember/Businessman Engineer Frank Ury are seeking the endorsement recommendation for Fifth District Supervisor. Deputy District Attorney Jeff Ferguson and Superior Court Commissioner Carmen Luege are seeking the endorsement recommendation for Superior Court Judge Office Number 35. (6:15 PM): Endorsements Committee Chairman Mark Bucher invites the three candidates to come to the seats in front of the committee table. (6:17 PM): Frank Ury says all three candidates are good Republicans. He says Mission Viejo is well-run. He says his body of work speaks for itself. He urges for brevity and election impact that the party stay neutral in this race. (6:19 PM): Robert Ming says the May 19 endorsement is so late in the primary that it’s not unreasonable for the party to stay neutral. He does however say it is important for the party to endorse because it’s discouraging for candidates and volunteers if tireless volunteers aren’t endorsed. (6:21 PM): Lisa Bartlett says it would hurt the party to endorse at this point. She says Dana Point has paid off its pension liability and has no debt. She urges neutrality. (6:22 PM): Bucher asks if the three would withdraw their endorsement requests. (6:22 PM): Ury and Bartlett agree to do so if all three withdrew concurrently. Ming declines to withdraw, reiterating the reasons from his opening remarks. All three stay in. (6:23 PM): Mark McCurdy asks about sustainable development. (6:23 PM): Ury says it needs to be done locally not by state bureaucrats. (6:24 PM): Ming opposes a force from above mandating this on the local community’s residents. (6:25 PM): Bartlett argues sustainability needs to be a local decision not a state one. (6:26 PM): Peggy Huang asks about Ury endorsing Democrats. (6:26 PM): Ury endorsed an apolitical Democrat who was running against a Republican who would soon be recalled. In the recall, he endorsed a Democrat against a tax – dodging incumbent Republican. That latter Democrat is now a Republican. (6:28 PM): Jeff Matthews asks why endorse at all. (6:28 PM): Ury says the second Democrat’s opponent was someone who would have been destructive to Mission Viejo. He said in both cases he picked the lesser of two evils. (6:30 PM): McCurdy asks if any of them would back bringing back Redevelopment Agencies. All three say they would not. (6:31 PM): Thomas Gordon asks why Ury didn’t stay neutral in the endorsement. Ury says the Democrat-turned-Republican has proven to be a solid conservative. (6:32 PM): Bucher asks what are the three most significant Republican endorsements for each candidate. Ury says he is endorsed by Sheriff-Coroner Sandra Hutchens, District Attorney Tony Rackauckas, and Congressman Gary Miller. Ming says he is endorsed by Supervisor Shawn Nelson, the Howard Jarvis Taxpayers Association, and the California Republican Assembly. Bartlett says she is endorsed by Congressman Darrell Issa, Chief Paul Walters, and unspecified South County elected officials. Craig Alexander is a Dana Point resident, a former Bartlett supporter for council who opposes Bartlett for Supervisor, and who is also supporting Robert Ming for Supervisor, because she voted to raise hotel taxes and to ban plastic bags in Dana Point after he implored her not to. He turned to her and looked at her and said she had taken his liberty away, his responsibility away, and every other Dana Point residents’ liberty and responsibility away. Larry Gilbert says Ury pushed to remove provisions of a city manager’s contract related to termination the day before the recall election. Bartlett says the TBID (Tourism Business Improvement District) is not a tax. She says the Supreme Court ruled the TBID is not a tax. She says Dana Point’s 10% TOT (Transient Occupancy Tax) is the lowest TOT of the County’s coastal cities. She says plastic bag bans work in her city because it is a tourist destination and coastal city. She says each city should decide for itself. She says her city lost conventions because they couldn’t mark the ecofriendly box before the plastic bag ban. Ury says dismissing without cause requires a six month severance. The only change to the contract was that when the city cuts the contract for cause without severance, then the city has a right to go to a judge for a ruling. Gordon rhetorically asks Bartlett to explain what TOT stands for and whether she believes a fee is not a tax. Bartlett says the Transient Occupancy Tax is a fee and not a tax. She says many cities set up TBIDs which allow hotels to determine how to spend collected TBID funds in their area. She says only four hotels are in Dana Point’s TBID. She says the four hotels determine how to spend the TBID funds. Jeff Matthews and Mark Bucher ask lots of questions asking for clarification on how the TBID works. Bartlett says the four hotels could not establish an additional fee unless the city granted a TBID because that would be colluding in violation of antitrust laws. She says the TBID money collected is tax-free and is used specifically to market the City of Dana Point as an international tourist destination. 64% of Dana Point’s revenue comes from TOT. That’s $15 million. Gordon asks why is a $3 TBID imposed when Dana Point gets so much TOT revenue. Ury and Ming say they do not have TBIDs in their cities and have 8% TOTs. Peggy Huang asks Bartlett about her argument that the courts ruled that TBID is a fee not a tax as a reason to impose it. Bartlett says that’s not why. She says it’s because the money helps develop economic and tourism growth. She says it works for Dana Point but wouldn’t necessarily work in other cities. Huang asks if this is a form of corporate welfare. She says it sounds like it’s a way for hotels to skirt the IRS with city sanction. Huang asks Ury about lifetime health benefits for Councilmembers. Ury says a prior Council gave staff and Council lifetime health benefits. Ury made sure all employees hired after 2007 would not get this. Ury signed an affidavit forsaking his lifetime health benefits. He says he’s the one who found the problem. He only voted against an item of this sort because it was posturing and was completely redundant with an item he’d already done. McCurdy asks about civil liberties, pointing to the example of scanning all license plates as Fountain Valley is doing. Ming says he opposes license plate readers and supported banning red-light cameras in Laguna Niguel. Ury says he opposes license plate readers. He points to his immigrant family who fled from Communist Hungary. Bartlett opposed red-light cameras in Dana Point but believes each city should decide for itself. Gordon asks if a fee is a tax personally and about whether Supervisors should have pensions. Bartlett says a fee is not a tax. She says individuals should pay for their own pensions. Ury says a fee is a tax. He opposes both. He agrees that individuals should pay for their own pensions. Ming opposes fees and taxes. He says he would decline a pension and that elected officials should not take pensions. Bucher asks a followup on plastic bags. Do cities have to ban plastic bags to be deemed ecofriendly? Bartlett says hotels kept coming to the city saying they lost business from not getting conferences due to not being ecofriendly. She says that plastic bag bans were the least onerous way to become ecofriendly. Gordon asks why couldn’t the free market just get rid of plastic bags instead of having a government mandate. He asks why couldn’t the TBID money be used for reusable bags? Bartlett said residents, merchants, environmental groups, and hoteliers called for the plastic bag ban. Craig Alexander interjects that the Dana Point Chamber of Commerce opposed the plastic bag ban. Questions are complete. The candidates step back, and the committee begins deliberations. Huang moves to endorse Ming. Matthews seconds for discussion. Huang is troubled by Bartlett’s stance on taxes and fees and by Ury endorsing Democrats. Matthews says when multiple good Republicans are running, many in the party say it’s best not to endorse. He says the party needs to figure out a way to determine who’s in good standing. He wonders if the party needs to adopt a formal policy. He is very troubled by Bartlett’s plastic bag ban. He is somewhat troubled by Ury endorsing Democrats. Gordon is very troubled by Bartlett’s stance on fees and taxes. Ming is recommended for endorsement by a 4-1 vote. (7:11 PM): Jeff Ferguson speaks about his record of handling thousands of cases. He speaks of being involved in a massive task force involving several federal and local agencies that resulted in 128 indictments. He speaks of being involved in forfeiture cases. He speaks of having broad legal knowledge. (7:14 PM): Carmen Luege speaks about that it is good for the Republican Party to endorse her because she has 30 years of legal experience after graduating from UCLA. She spent 7 years as a civil attorney and 17 years as a federal prosecutor. She has spent 6 years as a Superior Court Commissioner. She speaks of valuing freedom after experiencing the oppression of communism. She says she is endorsed by the Lincoln Club, Grow Elect, and Senate Republican Leader Bob Huff. She says it is good for the Republican Party to endorse a female Hispanic for judge. (7:18 PM): Scott Voigts says Jeff Ferguson has been in the trenches walking precincts and paying for Flag Day tables. He was a prosecutor of the year. (7:19 PM): District Attorney Tony Rackauckas speaks about Ferguson’s good judgement. He saw Ferguson’s good judgement when they were both prosecutors. When Rackauckas was a judge, he saw Ferguson’s good judgement in the courtroom. (7:21 PM): Adam Probolsky says Luege couldn’t be involved in the party because being a federal prosecutor and court commissioner prevented her from being involved. He notes they could have brought Governor George Deukmejian or a former member of Congress to speak for her. He says perhaps it’s best for the Party to stay out. (7:23 PM): Mathews asks why Luege cited judicial canons of ethics in not answering the questionnaire. (7:24 PM): Luege explains that she is already a judicial officer as a Court Commissioner while Ferguson is not currently a judicial officer. (7:25 PM): Ferguson says he was subject to the canons when he entered the race. (7:26 PM): Luege says that only applies if he is elected. (7:27 PM): The deliberations begin. Matthews admits his previous statements on Supervisor were a diatribe. He isn’t sure how they can pick between the two. (7:28 PM): McCurdy says Ferguson’s involvement and answering the questionnaire are advantageous. He realizes circumstances may have hindered Luege’s involvement, but circumstances in life are not always fair. (7:30 PM): Huang says she has practiced both civil and criminal law and appreciates seeing well-rounded candidates. Huang says Luege has done both civil and criminal cases. Huang believes it’s important for judges to have backgrounds in both. (7:32 PM): Gordon says he has seen Luege at Republican events, so she is involved too. He leans toward keeping the party out of this race. (7:33 PM): Bucher says he’s inclined toward neutrality as well. (7:34 PM): Gordon moves and Huang seconds neutrality. Gordon says the candidates should appeal to the voters. The vote is 5-0 for a recommendation of neutrality. NO ENDORSEMENT FOR SUPERIOR COURT JUDGE OFFICE NUMBER 35. We’re live from the 5th Supervisorial District Candidate Forum, sponsored by CWLA, the Laguna Woods Village Satellite Republican Group, and the South Orange County PAC. The three major candidates are here: Mayor/Businesswoman Lisa Bartlett (R), Orange County Businessman/Councilmember Robert Ming (R), and Councilmember/Businessman/Engineer Frank Ury (R). The minor candidate, Deputy District Attorney Joe Williams (NPP) is not here. We await the start of the forum. 6:48 PM: Bartlett gives her opening statement. She was born in Culver City and came to OC at age three. She goes over her electoral history. She says Dana Point had no unfunded pension liability and no debt. She says the County has a $9 billion budget and 18,000 employees. (Editor’s Note: she uses this $9 billion figure three times, but the County budget is $5 billion. Also, there are 17,000 County employees.) She speaks about her education. She is an executive at her business. She says she serves on regional boards in leadership roles. 6:50 PM: Ming gives his opening statement. He speaks about his work as counsel at an investment banking firm. He speaks about his wife and four children. He speaks about his fiscal responsibility and protecting public safety, roads, and parks while improving how all of those services and social services are delivered. He speaks about his leadership helping form ACC-OC and leading the Military Support group. 6:52 PM: Ury gives his opening statement. He praises Pat Bates’s service. He speaks of serving in elected office for a decade. He gets the first laugh line of the night joking about being an engineer in politics. He speaks about his family. He speaks about economic development and job creation. He says Mission Viejo has a AAA bond rating. He says Mission Viejo is the second-least expensive CA city to do business and is the safest city. He notes that he serves on OCTA. 6:54 PM: First question is about the $150 million VLF money owed by the County to the State. 6:55 PM: Bartlett proposes centralizing IT at the County. She suggests looking at shared services for public safety and social services. She describes AB 109 prison realignment. She speaks about how public safety is the top priority of government. 6:59 PM: Ury says the County needs to send people up to Sacramento and DC that they want to see up there, not people who have an acrimonious relationship. He speaks of shared services between agencies. He’d like to have a “Buy OC” program to provide services from OC vendors. 7:00 PM: Question on pension reform. County has already implemented 1.62% at 65 and requiring employees to pay their entire employee share. 7:01 PM: Ming proposes allowing employees to select from more investment options for retirement plans. He says working for efficiencies would ensure the number of members of the pension plan would be efficient. He speaks about leading ACC-OC’s pension reform plan. 7:02 PM: Ury says he implemented pension reform in Mission Viejo and at OCTA. He speaks about Mission Viejo’s Rose Award from OCTax. He speaks about the importance of viability of plans. He proposes leasing out County facilities for cell towers. 7:04 PM: Bartlett speaks about the Vallejo bankruptcy. She says Dana Point has made advance payments to eliminate their pension liability. She proposes balancing costs to employees and paying off the pension costs by controlling the employee pension contribution. 7:06 PM: Question on Caltrans, OCTA, 3+ HOV lanes, and toll lanes (e.g. the 405). 7:07 PM: Ury says South County is fine. He doesn’t want Caltrans to impose another toll lane. He believes the current number of toll lanes is fine. He says adding two free lanes to the 405 would have come at the expense of the El Toro Y. 7:08 PM: Bartlett speaks about developments like Rancho Mission Viejo. She speaks about the Tesoro extension on the 5. She says gridlock can be addressed locally or in Sacramento. She calls for open-mindedness, though she prefers not having 3+ HOV lanes. 7:09 PM: Ming says voters passed Measure M, and OCTA should give the voters what they voted for. He is a TCA board member and says people should get what they voted for. 7:11 PM: Question about the 241 toll road extension and widening the 5 via the Tesoro extension. 7:12 PM: Bartlett wants to complete the Tesoro extension and the 241 toll road extension. She says that people need alternative exit routes in case of evacuation. 7:13 PM: Ming supports the Tesoro extension. He says he supports the 241 toll road extension but with a different route and approach. He’d like a compromise for all stakeholders. 7:14 PM: Ury supports both extensions as well. Ury says it is a conflict of cutting down carbon emissions versus reducing congestion. He proposes locking everyone in a room. He says the air quality people are also the anti-extension people, and he says those are positions in conflict. 7:16 PM: Question asks what’s the difference between the candidates. 7:17 PM: Ming speaks about having spent his career bringing together conflicting parties to reach a compromise. He says he is a consensus builder. He mentions his ability to work with existing Supervisors and notes his endorsement by Supervisors’ Chairman Shawn Nelson. He says standing on principle helps people better understand where a Supervisor stands on issues. 7:18 PM: Ury says he is an engineer, which brings a different skillset. He says he is a problem solver. He speaks of leading a division of Intel. Ury says he is the only one who works with a $1 billion+ budget via OCTA. 7:19 PM: Bartlett says she is a woman. She speaks of her experience of efficiency, balance budgets, and leading staff. She says she brought her private sector experience to Dana Point and wishes to take that to Orange County. 7:20 PM: Question on affordable housing. 7:20 PM: Ury says the state needs to understand what it is imposing on local communities, particularly unfunded mandates. He says there needs to be jobs and homes for 20-33 year olds, who are leaving OC because it’s too expensive. 7:22 PM: Bartlett suggests public-private partnerships. She says more jobs allows more people to afford homes. She wants to put in developments with multiple price points. 7:24 PM: Ming says housing developments take a lot of time, effort, and work from the private sector. He says home builders need incentives like property rights protections in order to actually build homes. He says government doesn’t build homes. 7:26 PM: Questions about homelessness and a homeless shelter. 7:26 PM: Bartlett says homelessness is in every city. She speaks of government working with nonprofits to prevent homelessness. She says a bed, food, and shelter is not necessarily the answer. She says providing hospitalization and similar facilities is needed. She says the cities should address homelessness first before the County does. 7:28 PM: Ming says government does some things well and some things poorly. He says the same is true of the private sector. He says the private sector does an excellent job with homelessness, pointing to the OC Rescue Mission. Ming says government should facilitate nonprofits solving homelessness. He wants government to partner with nonprofits to teach people to fish rather than giving them fish. 7:30 PM: Ury speaks about his daughter’s work with disadvantaged teenage girls. He says there needs to be more dialogue with faith-based organizations. He says his church has a food kitchen and shopping carts. He believes faith-based groups have been left out of this for too long. 7:31 PM: Question about restoring confidence in government. 7:31 PM: Ming wants to expand accountability measures. He says government needs to spend money logically, and he says the County should better communicate what the County does and what it’s spending it on. He calls for strong leadership and accountability. 7:33 PM: Ury says put transparency in the light of God, pointing to the Latin root of confidence. He speaks about televising Mission Viejo’s Council meetings. He calls for better ways for people to search for documents. He wants to bring more public comment to meetings. 7:34 PM: Bartlett says better communication is needed. She says CalOptima and IT centralization are good things that need to be communicated to the public. She wants to tell people what County services are available to them. She says she wants to educate the public. There are murmurs of opposition in the crowd. 7:37 PM: Question about Dana Point Harbor revitalization project funding. 7:37 PM: Ury says the project has $40 million of the $120 million needed. He says there needs to be a charge to fund the harbor in perpetuity. 7:38 PM: Bartlett notes she’s lived in Dana Point for 25 years. She says her first four years got downtown and harbor plans approved. She says this plan will revitalize Dana Point Harbor and make it the jewel of South County. She says she has experience working with the Coastal Commission. She suggests using a combination of General Fund, grants, private funds, and government bonds to raise the funds needed. 7:40 PM: Ming says the project’s first phase is fully funded. He says phase one should be completed before moving on to funding other phases. He says the results of the first phase need to be seen, so the private sector can see if it wants to help fund the later phases. 7:42 PM: Question about personal values, strengths, and weaknesses. 7:43 PM: Bartlett says her strength is building consensus and leading regional agencies. She says she has an open-door policy. She says people seek her advice. She says her weakness is that she’s a night owl. 7:43 PM: Ming says his faith, family, and freedom are his three top values. He lives his personal life by the moral standards of his faith. He is in government to help make the world a better place for his four children. He wants to protect people’s freedoms because that is what the U.S. is about. He says his strength is listening to people and discussing things with them. He says his weakness is doing too much. 7:45 PM: Ury speaks of being born in Long Beach and growing up in the Midwest. He speaks of his Calvinist minister grandfather and his Hungarian Revolution-fighter father. He says his strength is his financial background at both the school board and the city council. He says his weakness is doing too much. 7:47 PM: Question on what they admire about their opponents. 7:47 PM: Ming praises Ury and Bartlett’s work at ACC-OC, where all three have served in leadership. He says he considers them both friends and hopes the friendships last beyond the campaign. 7:48 PM: Ury notes that Ming was ACC-OC’s first president, Bartlett was the second, and Ury is the fourth. He says Ming is a hard-worker and does his due diligence. He says Bartlett is passionate about issues. He says the challenge is all three run well-governed cities, unlike Los Angeles. 7:49 PM: Bartlett says all three are dedicated public servants who have reached out beyond their city boundaries to serve on regional boards and commissions. She says all three work well with others. 7:50 PM: Ury gives his closing statement. He praises Pat Bates and says he hopes she sticks around. He speaks of priorities of job growth, economic development, and infrastructure. He says Laguna Woods’s senior mobility program had a funding problem that Ury helped solve at OCTA for the next five years before it even became an issue. He speaks of his endorsements from Sheriff Sandra Hutchens, District Attorney Tony Rackauckas, Congressman Gary Miller, OCTax, and OCBC. 7:53 PM: Bartlett says she gives 110%. She says Dana Point is on solid footing. She says she is on regional boards and commissions, including as Chair of F/ETCA and on SCAG’s Executive Board. She says she has endorsements from elected officials in the 5th District and outside the district, though she does not name them. She speaks of working on contracts with other agencies. She speaks of senior services being well-rated in Dana Point. She speaks of being able to work with people of all levels, from secretaries to executives. She says Supervisors must work with state legislators and members of Congress. 7:56 PM: The moderator has to cut off Bartlett for going over time. 7:56 PM: Ming urges people to look at voting records, and he is proud of every vote he’s cast. He says job growth requires government getting out of the way. He says overregulation must stop. He says Laguna Niguel does not have a AAA debt rating because it has no debt. He speaks of the Laguna Niguel City Hall being paid for in cash, not debt. 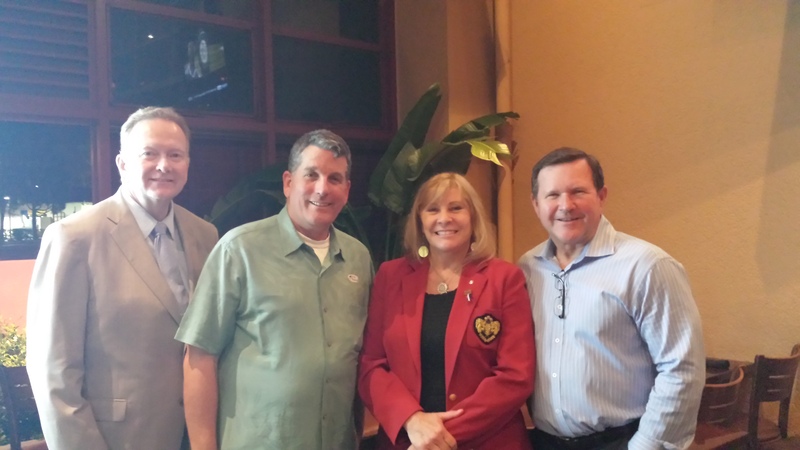 He notes his endorsements by Supervisors’ Chairman Shawn Nelson, Senate Republican Leader Bob Huff, Howard Jarvis Taxpayers Associaton, and the Lincoln Club of Orange County. He says he is a bridge-builder who is a consensus-maker. He says he listens to his constituents. 7:58 PM: The moderator acknowledges the presence of outgoing Supervisor Pat Bates, and the forum ends two minutes early.